Short chapter book based on the traditional English tale, "Kate Crackernuts," with a touch of Tam Lin. The repetition and magical elements definitely give it a folktale quality, though the language does not always live up to the material. Kate is the traditional kind-hearted maiden, but there is a twist: her stepsister Meghan is the more beautiful. However, Kate's mother contrives to disfigure Meghan so that Kate will be the one to shine by comparison. Kate, however, foils her plan when she works with the despairing Meghan to restore her fair face. The lush, full-color illustrations by Winslow Pels illuminate the whimsical story. Kate sets out to help her stepsister, who has fallen under a curse. With the help of the Salmon of Wisdom and the Tree of Knowledge, noble Kate sets right a wrong and finds love and happiness in the bargain. Mayer weaves traditional Celtic elements in her sweet version of this folktale. With exquisite, full color illustrations by Winslow Pels. Grades 3-6. 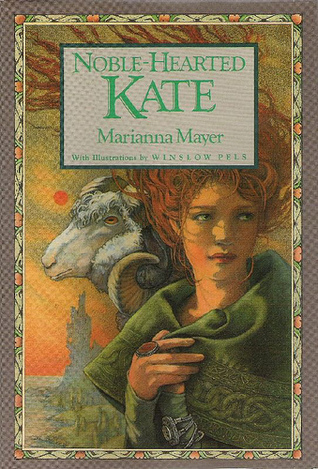 "CIP: "Using elements of traditional Celtic lore, relates how Kate helps her stepsister Meghan to break the spell that has given her the head of a sheep. "Note: I was unable to find any published reviews of this book. A great autumn season story with vivid mythology. I liked this tale, and the chapters were just the right length for a leisurely bedtime story for the wee ones. I think I might purchase this one, as I liked the references to Samhain and the salmon of wisdom and the hazelnut wand. Found this in a list of books recommended for Pagan kids and picked it up from the library. A blend of many myths and fairy-stories, accompanied by illustrations (I think in colored pencil). The pictures were my favorite part, along with the appearance of the salmon of knowledge. I love the way Marianna Mayer retells fairy tales. Marianna Mayer Winslow Pels - Marianna Mayer lives in Roxbury, Connecticut. "I see folktales and myths as humankind's first stories," says Marianna Mayer. "They are a kind of collective dreaming, filled with timeless symbols and images we can all relate to, regardless of age or culture. And, much as an oyster must be disturbed by a grain of sand in order for the pearl to be created, I often choose to retell stories in which I find unresolved fragments that are somehow perplexing to me." Though widely known as a children's book writer, Marianna Mayer's early education focused on visual art. "It seems to me there was never a time when I didn't want to be an artist, " she says. "I liked to tell stories with pictures and compose music. My sister and I put on plays made up from my stories. And then I decided to start writing a book, at the age of nine." She published her first book at the age of nineteen. After college, she studied painting at the Art Students League in New York City. Her experiences as an artist provided many images that she began to incorporate into writing. Gradually, she shifted to the written word as a medium of expression. She explains, "I began to feel more freedom when using words as my paints and plots as my canvases. "While in the midst of a writing project, I live so much in my mind that what takes place in my imagination becomes quite real to me. I try to become part of the culture of a particular tale as much as possible. While working on Baba Yaga and Vasilisa the Brave, for example, I read all I could about Russia. What I learned about Slavic mythology helped to deepen my understanding of the story. I listened to Russian music, ate Russian food (which I love! ), and tried in other small ways to enter into the essence of that culture." "My writing is deeply personal. First and foremost I write for the child who still lives within me. Then to the child in others, whether that child resides in a young person or an adult. I'm striving to reach out to that spirit of wonder within us all. The stories I was told as a child, those half-remembered folktales and myths, have become the foundation for what I continue to work on in my books. The sense of hope that books instilled in me as a child saw me through many difficult times. Because of this, I choose characters who face overwhelming odds but triumph through courage and perseverance. Similarly, myth allows a child to believe in his or her own dreams and can instill a boundless hope for the future."